I am having some serious issues with my back (if you saw on Instagram) and am drugged up in bed (not as fun as it sounds, I promise), so I enlisted the help of Stacie, our health and fitness contributor to share this incredible Bowtie Spinach Pasta recipe. Take it away, Stacie! This recipe is perfect for the athlete and mom on the go. 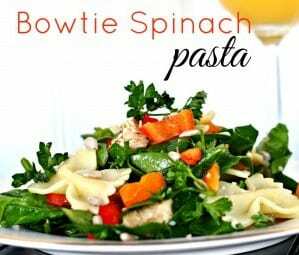 It has your leafy greens, bowtie pasta for carbohydrates, and sweet peppers for a pop of color! I often eat this salad during training because it does not sit heavy in my stomach but it fills me up! Enjoy!! Be sure to check us out over at AT RACE PACE as we are kicking off our Mommy Marathon Training Schedule this week! 8 oz. Bag or box of bowtie pasta cooked and cooled. 1 Bunch of green onions chopped. 1/4 C. Salted sunflower seeds. 1/4 C. Red peppers chopped. 1/4 C. Yellow peppers chopped. For best results, marinate chicken and dressing over night. (I don’t always remember to marinate the chicken and it turns out just fine). Thanks for sharing Stacie, hope you all check her out on At Race Pace, and I hope you all enjoy this recipe as much as I plan to!